I've not been blogging much lately; stuff has been happening. Not the least, of course, has been the passing of Sherrie Orpwood on Friday, December 18, 2009 ... which I briefly noted here. Today was her Memorial Ceremony, and it was much more difficult ... personally ... than I had expected. There were about 40 people in attendence. A dozen were there specifically because we knew Sherrie in the context of IPSC/USPSA competition, and most of us knew Sherrie and Lorin as a couple who worked the stages ... especially the Jungle Run ... together. The rest of the folks at Sherrie's Memorial were Family, and Friends from work. Sherrie and Lorin were 'second marriages', and I was not always clear on who was the progeny of Sherrie, or Lorin. So forgive me if I get the citatations wrong. The people at the ceremony were so loving in their paeans to Sherrie, I will always think of them as if she was their blood-mother/grandmother, and Lorin their blood father/grandfather. Sherrie's son lead the ceremony, and I was impressed by his ability to control his emotions as he spoke of the love this woman. Sherrie's husband, Lorin, found it difficult not to be overwhelmed by his grief. I sympathized with this; I'm not good at thinking of the deceased as "gone to a better place". All I can think of is the void their absence creates in this place, in which I reside. Me and funerals (or 'Memorial Services') don't get along to good. They beat me up, and I whine a lot. I've known Sherrie for something like ten or twelve years. I'm not sure how long. But in all that time, I have met them outside of a shooting range fewer times than I can count on the fingers of my thumbs. I have heard many family members speak of the way that Sherrie and Lorin served to combine their families in comfort and in love, to the benefit of each family member. And I have heard tje the people who worked with Sherrie describe how effective she was as an on-line sales representative, because "she loved her customers". But I knew Sherrie and Lorin in the context that they were always together. Their purpose was not to complete one another, but to BE with one another. The best thing they did together in public, and the joint venture of which they were most proud, was that they first designed and implemented the "Jungle Run" stage in "Dundee Croc Matches" for several consecutive years. Lorin and Sherrie both competed in USPSA competition from time to time. But that wasn't really very attractive to them. What they really enjoyed was designing and building a challenging stage, and then runnimg competitors through the stage to win, or lose it all ... Sherrie and Lorin were great advocates of encouraging competitors to seek their greatest rewards by "pushing the envelope", and they were always fair when evaluating the performance of each competitor. But I couldn't give this Eulogy, because I was much to emotional at the Memorial Ceremony. Because my Significent Other ("SWMBO") is dealing with Lung Cancer, I was unable to control my emotions. When the service was over, I immediately grabbed my coat, draped it over my shoulders, and headed for the door. On the way out I noticed Caryn, then Rob Shepherd. I shook hands with both of them with out breaking stride, and in the process mentioned something like "too close to home, I can't deal with it'. Sandie is too vulnerable to the ... whatever ... that Sherrie experienced, and I cannot stand around and quietly discuss Sherrie without thinking about Sandie at the same time. This is, indeed too close to the areas in which I perceive myself as too vulnerable, and I am not prepared to deal with the prospect of loss at this time. Lorin, I do hope that you understand that my running away was not because I care the less for your loss, or for the untimely loss of your lady Sherrie. It's just that it is all close to home, and I am unable to control the emotions ... any more than were you, today. Sorry, Pal. I know what you were going through, and I now how hard it is to deal with it when your nerve endings are prominent and you cannot handle the pain of the most unlikely comment... it's all pain, Lorin, and if I could take your pain into myself to spare you ... I would not have the strength; I could not, and I would not, take your pain. For all of our friends, relatives and neighbors ... Sandie and I hope that you have the safest and most rewarding Christmas Ever. It is with great sorrow that I must inform you that Sherrie of the Jungle, "The Princess of the Universe", has passed away from complications of Cancer. Sorry, I'm not completely certain that her cancer is the direct cause of her death. But she was always so vital, so energetic, I cannot imagine that she is the victim of a less virulent and evil cause. This is one of the most difficult things for me to do, to describe the passing of a magnificent Lady. 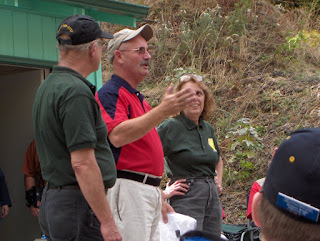 Sherrie Orpwood, and her husband Loren, have given much of their time and energy in the presentation of excellent USPSA/IPSC competition in the Jungle Run of the Dundee "Croc Match" and other matches. This is a measure of their devotion to the sport of Practical Shooting, but it is not the full measure of their contribution. When SWMBO was diagnosed with Cancer in 2008, Sherrie and Loren revealed that Sherrie had been fighting Breast Cancer for over a year, but chose not to announce their battle until it became clear that they could offer encouragement to Sandie and to me by offering their experiences to help us deal with the pain of cancer in the context of their own battle. During the past 18 months, they have been among the most stalwart supporters by the example of their experience, and the lessons they have learned. Sherrie, by her determination to "beat this thing"; Loren, by his loving support of Sherrie. Now, Sherrie has lost the final battle, and her excellence may best be demonstrated by the contribution they have made in terms of time, originality and effort devoted to the creation of an excellent competitive challenge presented by the Jungle Run at Dundee matches. Slow, repetitive, predictable, I knew without looking the source of the noise. It was The Old Man with the Walker. I've seen him before, but I've heard him more times than I've seen him. Usually he comes through the halls of my office building about this time every day, but today, rainy and cold as it was, he was bypassing my office building and was instead bypassing the office building and traversing the sidewalk between the buildings. The Scrape was his walker dragging as he ended the four-phase cycle of a step. The Clunk was when he put the front wheels down to roll, and advance a few inches along his designated slow-speed highway. The Rattle was when he picked up the front legs of the walker, and the crazy-wheels on those two legs wobbled momentarily in the air. The scuff was when he moved one foot forward a few inches to take another step. Have you ever seen an inch-worm? An inch-worm is Blazing Saddles compared to The Old Man with the Walker. I first saw him today probably 30 yards up the sidewalk, inch-worming his way along. He was dressed in faded dungarees, sort-of-white sneakers, and a yellow rain-coat with a blue hood pulled over his head. It wasn't raining at the moment, but it was NorthWest Rain Forest raining for most of the day. Still, he chose to walk along the path instead of short-cutting through the building. I've never talked to him. I've never stared at him as he passed by the door to my office ... instead I paid him the left-handed compliment of ignoring him as he made his painful way. Today, it took maybe three minutes to traverse the maybe-thirty-yards to pass my non-observation point. He was hunched over, skinny-legged, and in his parka-hidden crooked posture I discerned a man of probably Methuselah-age. Or perhaps Methuselah's grandfather. As he finally passed my observation point at a sub-snail pace, I watched him covertly. He couldn't see me, and in truth all I saw of him was his knobby hands clutching the handles of his walker. His walker was not the elegant and expensive design which includes both a fold-down seat on which he could rest, and a wire basket in which he could carry his books. Instead, he had the absolute cheapest, basic model ... a tubular aluminum frame, handles to grip, and small wobbly wheels in the front. It was my impression that all that he could afford, and it was good enough because it enabled him to walk from place to place ... which he clearly could not do without some kind of mechanical aid. Not looking to impress anybody, not asking for help, not trying to evoke any kind of sympathy from anyone, The Old Man with the Walker was just getting from Point "A" to Point "B" to go about his business. He had a small, cheap pack hanging from his scrawny shoulders, so I could only assume that he was a Student at this University. God only knows what he thought he could learn in a College, that he had not already learned from the proverbial School of Hard Knocks. It was my thought that he had already been knocked about in life as much as anyone has, but here he is carrying his maximum load on his back just trying to get from one classroom to another in the ten minutes hiatus between classes. As I watched him move to the West slower than the sun settling in for a well-deserved nights sleep, I thought a thought of actually engaging in a conversation. "Don't worry about it, Old Man. We all do the best we can. But I doubt that any of us could claim to do it with the Courage to confront and defeat our impediments so inevitably, and the determination to live our life with such grace as you." But I didn't say that, and couldn't have said it, and in my mind I would have wished to express my admiration more perfectly. Still a better man might have said something, and said it more precisely. In the actual event, I only watched The Old Man with the Walker slowly wend his way toward home, or to his next class, or anyway he wanted to go. He had a better handle on his life than I do, and even though I can move faster and more quietly, I could never do so with the dignity that this Old Man with the Walker demonstrated. There are people in our world who live every day with pain, and are 'handicapped' so that they cannot move and function with as much unconscious, unaware skill. But none of us contain one small bit as much grace as The Old Man with the Walker. Every time I hear that Scrape, Clunk. Rattle, scuff, I think about the pain he must overcome, every day and every way. I have been informed that my son has been awarded early promotion and the "Blue Jacket" in the Navy. Ben is a Master at Arms, stationed at the San Diego Naval Station in California. You may be aware that early promotion is awarded for exemplary achievement, which is a very important thing to get because along with the rank comes more responsibility, more challenging duties, and a raise in pay. The "Blue Jacket" is awarded quarterly in a command, so the recipient is referred to as "Blue Jacket of the Quarter". Recipients must perform extra duties, including off-duty study, so it's not just an 'atta-boy' which most service members can expect to receive. All recipients of that award in the command may then compete for "Blue Jacket of the Year", which (again) is awarded to only one member of that command in the year. I'm very proud of my son for his achievement, not only because it proves what I've always known ... that he is an exceptional man with developing leadership potential ... but also because it indicates that his commander is impressed by his devotion to duty and willingness to make the extra effort to be the best in his chosen profession. When Ben chose to join the Navy I was concerned, as any parent would be, for the safety of a child who chooses the military during time of war. Ben is a man now. Happily married with five children (the last two, twins) he has proven that he has left the nest and making his own way in the world. I realized that long before his commander did, I guess, but it never hit me so emphatically as it has now. Now ... I'm not sure if he will complete his tour and then look for a compatible civilian career, or if he will consider this recognition as a clear sign that there is a viable and attractive career for him in the Military. Not that it matters what I would wish for him to choose, but I have full confidence that whatever choice he makes, he will be successful. And I'll always be proud of him, no matter what he does. If you are skilled with a pistol, rifle or any other firearm, you could win $100,000 in prizes on TV’s first marksmanship competition show. The History Channel and the producers of "The Ultimate Fighter" are looking for anyone with mind-blowing shooting skills and a big personality to take on exciting physical challenges with multiple guns and mystery projectile weapons. When SWMBO was released from the hospital at the end of November, her oncologist didn't send her home with a prescription for antibiotics. Reason? No bacterial infection was detected in her lab tests. She had an appointment with a G.I. specialist on Wednesday, and he tentatively diagnosed her with 'ulcerative colitis' which is serious business ... and for which there is (according to the Mayo Clinic) no known cure. But there are treatments for the symptoms, among which are ... antibiotics. She came home with a one-week prescription ... four pills a day. The first night she couldn't sleep and spend the night sitting up on her couch, and sometime in the night she was overcome with nausea. Thursday she cut the ingestion of antibiotics back by one pill, and was able to sleep through the night. Friday she was feeling better, and this morning she was resting comfortable. Her voice is now stronger, she can concentrate on paying her bills, and her eyes were bright and shiny again. I've been staying with her most of the past week, which has been good for both of us. I can help her get through the days and nights, which is a much more positive thing for me to do than staying at my home and worrying about her. The short term looks good. I don't know when her next doctor appointment is, but hopefully she will by then be able to deal with the symptoms and the doctors can get a better understanding of what is happening to her. Other than some 'helpful' medications which she can take at home, there's not a lot of treatment being directed toward her Cancer. Instead, they're treating the side-effects of the medications, and the side-effects of those medications. But she's coming back, regaining her strength, and her quality of life is much better than it was this time last week. Hopefully, we'll both be back on our feet next week and we can pay more attention to our normal daily activities. "What do Greenpeace, the Sierra Club, and the Center for American Progress have to say about the growing Climategate scandal?" This interview addresses the concept of "Global Warming" not just within context of "global warming is caused by man-made issues", but in the context that "Global Warming" is actually a current and on-going process. "We've got ... the polar bears ..."
"The underlying data no longer exists." "I don't think there was an intend to deceive ..."
"If you are prone to believing that Climate Change doesn't exist you're grasping for emails to make that point." "... as it pertains to 1 the issue of climate change, we've got so much observable data ..."
"What kind of investigation are you looking for, exactly?" "I think that you and I can agree that the issue of climate change -- is settled." The interviewers don't seem to accept that the issue of climate change is settled. They insist that "global warming does not exist within the last ten years" and "the hottest decade in history was in the 1930's" (which suggests that "carbon emissions" are not the root cause of "global warming" or "Climate Change", because industrial and "Internal Combustion Engine" "Carbon Emissions" were demonstrably in the 1930's than in the 21st Century). The PJTV interviews were interesting, but not intrinsically convincing ... for either side of the question. However, one thing is clear: those who are convinced that "Climate Change" exists, and especially if they are caused by humanocentric activities in the 20th and 21st century, are all-too eager to jump on to the "The Issue Is Settled" bandwagon. 5. Draw Conclusions from your data. - Here, it is stated directly whether the hypothesis was supported or disproven. - If your hypothesis is supported, it should be repeated, since one of the basic foundations of the scientific method is that it is repeatable. The more an experiment is repeated, the more valid the results are. However, if there is a hypothesis that is supported by many experiments and a lot of data, we call that hypothesis a theory. - The word theory is often misused in everyday language. Theory and hypothesis are not synonyms, a hypothesis is just an educated guess that perhaps has been supported once or twice by an experiment. A theory was once a hypothesis, but is now supported by a lot of data and is accepted as being correct, until new information is discovered to disprove it. Note that the last sentence emphasizes the possibility that a "theory" is accepted as being correct, until new information is discovered to disprove it. What we have here is a 'theory', the proponents of which strive diligently to dissuade any effort to disprove it. This is not Science. This is religion, in that it is Faith Based. As such, it introduces a new panoply of "Gods" and stigmatizes anyone who would dispute it. It's now official. Much of the hype about global warming is nothing but a complete scam. Thanks to hackers (or an insider) who broke into The University of East Anglia's Climatic Research Unit (CRU) and downloaded 156 megaybytes of data including extremely damaging emails, we now know that data supporting the global warming thesis was completely fabricated. Inquiring minds are reading Hacked: Hadley CRU FOI2009 Files on The Reference Frame by Luboš Motl, a physicist from the Czech Republic. Since the CRU is staffed by credible scientists who welcome peer review, we would naturally expect an "open source" approach to validating data. Right? Okay, but at least they had solid computer programs which provided consistent results and forecasts based upon the "observable data" which they had gathered through (at least) recent years. Right? Well, perhaps not absolutely positively data which "has been supported once or twice by an experiment." Here is an evaluation of the code, based on observations of a programmer ("Harry"?) who has been tasked with validating undocumented code used to predict weather patterns, using the original data. Harry --- speaking as a professional Programmer and Systems Analyst, I can only say ... "I Feel Your Pain." Okay, this is the last of this series. Yesterday the Doctors decided that the problem was a combination of "Intestinal Blockage" and Diverticulitis ... the latter being the part that caused the excruciating pain. I've had it, it hurts, and don't ever let anybody tell you that you "can't remember pain". So they've changed both the anti-biotic regimen and the pain medication. SWMBO need not wake up every hour to ask for another shot: a Vicodin lasts her for four hours. If my experience is any measure, the pain should clear up in a few more days, but she'll be on anti-biotics for much of next week, perhaps a few more days 'tapering off'. SWMBO expects to be released from the hospital tomorrow morning; I'll get some time off work to take her home and make sure she's comfortable. Sorry I couldn't pass on this good news last night, but when I got home from the Hospital I had dinner and went to bed, where I slept for twelve hours. Yep, SWMBO is still in the hospital. When I went to visit her tonite, I discovered that she is no longer in "isolation". During the two days when her private room was an "Isolation Room", nobody was permitted to enter without first donning a yellow paper gown and blue latex gloves. They called this "Robe and Gloves". It was nice, being permitted to visit SWMBO without being swaddled in hot, uncomfortable "Robe and Gloves". More important, it was nice to see her looking much stronger, and more alert. She still has pain to deal with. From time to time you could see that she was experiencing a pang; she would grab her left side with her hand, arch her back, turn her head and grimace for five or ten seconds until the pang would ease. And yes, she's still receiving pain medication every hour ... if she asks for it. It's hard to get any rest this way, as when the medication wears off the pain comes back, and it's sharp enough to wake her up. She buzzes for the nurse, the CNA (Certified Nursing Assistant) comes in to learn that pain medication is needed. The CNA informs the nurse, and the nurse eventually arrives to feed one-and-a-half syringes of ...whatever ... into her saline drip shunt. In 10 or 15 minutes the pain becomes more bearable. That's followed by another 45 minutes of watching the clock. SWMBO want's to know when to ask for the next shot, so she can get it in time for it to take effect before the last shot wears off. Hard to sleep at night, but the doctor believes this is the best approach. The doctors have about given up on the tentative diagnosis that her may be a side-effect of the secondary medications she is taking to counter-act the side-effects of her chemotherapy. That's a convoluted sentence, but it just means they don't think it's a direct result of her cancer treatment. They have decided it is more likely a bowel blockage than Diverticulitis. They admit that they can't tell the difference in either X-Rays or CAT Scans, but they're going with the "Bowel Blockage". One suspects that choice is because the treatment of a Bowel Blockage is a short term course of treatment, and they can do something about it. If it is Diverticulitis, they'll know it if the other treatment doesn't work in the next few days. On the other hand, the antibiotics being administered with her saline drip will already be attacking the (theoretical) infection, so they're not really wasting any time with this course of treatment. The good news is, her diet has been changed from "clear liquids" to a diet with some solids. Yay! She can eat chicken noodle soup with vegetables, yogurt, etc. The bad news is, every time she eats something, the pain level increases. No word, of course, about when SHE will be well enough to go home. We're all just playing a game of Wait and See. But we're both confident that she is receiving the best care that Private Medical Insurance can buy, and we're very glad that if this had to happen, it's best that it happens before The Public Option rule comes into effect. Sorry; drifted into The Twilight Zone for a moment there. .... but this link is no longer active. For those of you who occasionally enjoy rereading Cooper's columns, the archives carry the "Cooper Commentaries" in 14 annual chapters covering the years 1983 through 2006. Col. Jeff Cooper passed away September 25, 2006 at the age of 86. Many of the earlier articles appeared in Guns & Amm0 Magazine in a monthly 2-page spread called 'Coopers Corner". Because of Coopers strong-held personal opinions, and his plain-talk manner of expressing them, G&A eventually -- reluctantly -- discontinued the monthly opinion column. Volume II of The Gargantuan Gunsite Gossip (GGG2) covers years 1990 - 2000. As far as I know, the last six years (2001 - 2006) of Cooper's Commentaries are available nowhere else besides the online website. And the first two years ... 1981 and 1982 ... are only available in the book: GGG1. For a list of all COGITO ERGO GEEK posts about, or referencing Jeff Cooper or his books, click on the keyword COOPER on the labels below. As predicted, SWMBO and I celebrated Thanksgiving Day together --- in the Good Samaritan Regional Medical Center. Also known as The Hospital. SHE had a cup of tea, a lot of water, some chicken broth, and a small cup of Strawberry Jello. As she sat in her hospital bed, holding the newly opened container of Strawberry Jello, I noticed that it smelled wonderful. I commented on the savory aroma to SWMBO. "Yes" she said. "I'm just sitting her smelling it. It reminds me when I use to sneak into the garden to steal strawberries. They tasted good, fresh from the garden, and stolen." That's a nice memory for her. And it gives her something positive to be thankful for. Well, that and temporarily at a pain level she can abide. Two hours earlier she had awaken from a nap in agony, clenching her waist and shuddering, when her inter-venous pain medication had run out. (She gets a new shot in the drip shunt every hour ... if she requests it. If she doesn't request it, they don't give it to her ... but it doesn't last more than an hour.) While the nurse was renewing the medication, she also extended her O2 line with a longer section which would allow SWMBO to move around the room if she wants. Later, she mentioned that "the air smells like plastic". It took a while for enough Oxygen to flow through the line to clean out the plastic aromatics. For the moment, they're wondering if it's a blockage in the intestines. They're working on that; it's an awkward diagnosis, because they really can't tell until, if that is the problem, it clears up. In the meantime it's humiliating to treat and is not entirely reassuring. I spent my day taking care of myself, getting enough to eat, doing laundry and household chores for SWMBO, and most of the afternoon and evening holding hands with SWMBO. My day was a lot more comfortable than hers. Her younger sister and her daughter (SWMBO's neice) visited this morning, and this evening she received calls from her daughter and two of her grandchildren -- her grandson is the father of a brand new baby boy, and that's another thing to be thankful for. Tomorrow, or perhaps Saturday, if her doctor allows her to eat something more complicated than "clear liquids", I'll bring her a dixie-cup size portion of Vanilla Bean Häagen-Dazs® ice cream. Among the rest of the things to be thankful for are our many supportive friends, and our families. Thank you all for your affection, and your support. Hope you all have a warm, rewarding and safe Thanksgiving Day. As the insufferable Dr. Ian Malcolm so infuriatingly states in Jurassic Park: "Life Happens". And thus is solved the quandary of what to serve for Thanksgiving Dinner with SWMBO. The answer: "Clear Liquids for the next three days". You may recall that Last December (2008), SWMBO's Oncologist observed her as being in the next thing to total systemic collapse as the consequence of 9 continuous weeks of weekly Infusions with platinum and other poisonous chemicals. She spent the better part of a week in the Hospital, completely missing Christmas and New Years. This year promises to be even less respective of Holiday Plans for SWMBO. This afternoon about 3pm SWMBO called me to ask for transportation to her Oncologist's office, and then to the hospital. She has been experiencing sever abdominal pain since Monday, and when she first went to see her doctor he prescribed for her ... powerful pain killers. When she told me that two days ago, she was still able to drag herself to the doctor, so I only learned about it in our regular weekday evening phone chat. I expressed surprise that he did not make a determined effort to learn the cause of the pain, but other than that kept my big mouth shut. Hard to believe, but true. Today, the Tyelonol-3 quit working. We got to the Doctor's office around 3:30. The Doctor palpitated her abdomen, bring expressions of 'discomfort'; noted some bloating, and announced that the cause of her pain was either (1) a side-effect of the chemotherapy, (2) an unknown bacteria infection, or (3) Diverticulitis. Whatever the cause, he recommended that SHE check into the hospital for more tests, observation, rest and hydration, close personal care and initial treatment with antibiotics and pain killers. SHE didn't want to do that, but became convinced when she asked him to define her alternatives. "You go home, get worse until you become entirely dehydrated, experience blackouts, and become so incoherent that you can't say NO to the hospital." So they put her in a wheelchair, wheel her to the hospital, and at 4pm check her into a private room in the new wing ... which is so new that the variable light-level controls haven't been hooked up to the lights. Glaringly bright lights illuminated the room while the attentive (but harried) staff in the FULL hospital tend to her. Give her a gown, and some privacy to change out of her street clothes. After two hours, a new technician comes in to poke another needle in her arm, in a new place. She installs a temporary shunt into which she can plug a saline drip, the prescribed antibiotics, and pain killers. Then she goes away. 40 minutes later, SHE buzzes for the nurse to ask please, I need water and the anti-biotics and something to make the pain go away. The nurse takes her entire medical history back to 1968. Injecting a pain killer into the shunt, she announces that this can be given to her "once every hour ... if needed"
Isn't real sure what antibiotic will be added to the drip but "we'll get something to you real soon, hun." The pain killer finally started to take effect, and her eyes grew heavy. I had to leave to go pick up my own prescription, which I had planned to get on my way home from work. So SHE will be in the hospital on Thanksgiving, taking only "clear liquids" (fruit juices, broths, water, jello, etc.) for the next day or two. Chances are that she only 'may' be well enough to leave the hospital on Saturday. Actually, the initial diagnosis of Diverticulitis (which is the acute stage of Diverticulosus ... which she already knows is an unrelated malady ... the two conditions together are called Diverticular Disease) may be the real answer here. I experienced Diverticulitis 5 years ago, and it was agonizing. It felt as if someone were jabbing a red-hot poker through my left side; it doesn't throb, or ache -- it is a very sharp, localized pain which does not lend itself to ignoring no matter how tough you think you are. All you can think of is: "Please, someone, make the pain go away!" I'm not attempting to diagnose, but if what SHE is feeling is as she described, I know how that dominates your attention ... for hours, or days, and it only gets worse as it goes untreated. But if that is the cause of her severe discomfort, at least she can be assured that it is treatable by antibiotics, and there are many standard pain killers which either dull the pain, or make it so that you really just don't much care. The original treatment takes a week to ten days to resolve the pain issues, and the better part of a month before the antibiotics actually kills the infection and allows you to get back on your feet. I sure hope it's 'only' Diverticulitus. Two congressmen (Rep. David Obey, D-Wis., chairman of the purse string-controlling House Appropriations Committee; and Sen. Carl Levin, chairman of the Senate Armed Services Committee) are calling for a tax on 'the wealthy' to pay for the War on Terrorism in Afghanistan. "If we have to pay for the health care bill, we should pay for the war as well ... by having a war surtax," Obey told ABC News in an interview that aired Monday. "The problem in this country with this issue is that the only people that has to sacrifice are military families and they've had to go to the well again and again and again and again, and everybody else is blithely unaffected by the war." Surely the military families have borne the greatest burden in this and in any war, but the idea of a surtax (based on Income Tax returns, and only for a select group of tax payers) is new. No, the idea that "the wealthy" should bear the greatest tax burden is far from new. They already do, and politicians find it easy to play the Class Card when proposing new taxes. What is new is the Congress now feels it safe to attack "the wealthy" in a tax over and beyond the income tax ... which "the wealthy" now pay an overwhelming majority of what becomes income for the Federal Government. Congress once was called upon to vote whether or not to end "The War on Terrorism", but were either too cowardly or too shame-faced to actually put their vote where there mouth is. Now they have found a new way to attract unlikely allies in their continuing campaign to end American participation in the necessary -- but unpalatable -- war. But what's even worse is the attempt to justify new taxation based on the assumed inevitability of the National Health Care bill. Now we can be just like The Brits: Subjects, not Citizens. Ed Begley, Jr. (who played a hippie in the 1982 file Eating Raoul) recently appeared on the Fox News Channel in an interview concerning Global Warming. Apparently, Begley is vigorously "Green" and believes that the information on "Climate Change", including that it is the result of human actions, is definitive. That's not the whole story, though. The aging actor was very careful to say that we should "get our information from the scientists, not from actors or television interviewers". Also, he refused to state that the issue "has been settled". Click on the video for an amusing example of an interview which starts out civilized, quickly descends to over-talking each other, shouting, finger pointing and name calling. This interview was conducted after the recent revelations that Climate Scientists who supported the "Climate Change Is A Result of Human Activity" concept have been found to be collaborating in a gigantic hoax to skew the reported data in order to support their theory. It would be interesting to know what Begley thinks of the whole Climate Change thingie in view of recent developments. We may agree that Peer Review is a good way to evaluate scientific announcements. However, the reliability of the check-and-balance process is undermined when the peers are in cahoots. SWMBO endured another "Effusion" on Wednesday, which (according to her Oncologist) means that her auto-immunity system is -- to coin a word -- "Trashed" for seven to ten days. This will be the case every 3 weeks after each effusion. So that rules out T-Day with the family. Hers, or mine. We can't take a chance of mingling with people who, however valued and loved, may be hacking up The Lugie of Death or otherwise communicating whatever communicable disease they may harbor. They can catch The Common Cold, and suffer nothing more than a minor inconvenience. For her, the same germ/bacteria/virus may, even in its least virulent form, put her in the hospital for weeks. Or worse. So we are a Party of Two for the Turkey-Day Restaurant, which will take place at the oh-so-exclusive venue of Chez SWMBO. Last year we had Spaghetti. Or was that the year before? We have also celebrated this Day of Thanksgiving with Pizza, Smoked Salmon and Camembert Brule' (Cheese wrapped in Croissant dough and over-cooked, also known as Camembert En Croissant when we remember to take it out of the oven after a half-hour), and Cheerios on the Half Shell. Okay, I made that last one up. In truth, we had a big Ham Roast. But that doesn't sound as adventuresome, does it? This year we are thinking about a much more controversial dish: Turkey. For the two of us, it makes no sense to buy a 12 pound Turkey. We'd just have to throw most of it out. Besides, I don't like Stuffing and neither of us like "dark meat". I note that Fred Meyers stocked their freezers with Turkeys on Saturday, so there is a nice "Breast Meat Only Turkey" available if we get there before they're sold out, so we'll probably buy five pounds of frozen Turkey Breast and consider ourselves Real Americans. I'll wear a wide-brimmed, tall black hat with a buckle in the front, and SWMBO will wear lots of petticoats and a frilly bonnet tied under her chin. What's an appropriate dinner for two in isolation? Actually, we don't much care. In one way, it's just another Thursday, except that we have a four-day weekend to spend together. In another sense, we want to share a National Day of Thanksgiving with the rest of our country, if we can't share it with our family. We both have so much to feel thankful about. If you are a regular reader of The Trials of SWMBO, I don't have to tell you about it; you already know. Ultimately, though, it doesn't matter what version of Gluttony we chose. The main thing is that we enjoy the company of each other. The most important thing is that while we are stuffing our bellies, we can be planning another Thanksgiving together. PS: SWMBO's latest evaluation shows that her Blood Oxygen is up and her tumor "has gone from 3.6 to 3.2". Neither of us knows what this means, or what the measurement is. But we are assured that it is an improvement. We'll take what we can get, be it a medical evaluation, or another Thanksgiving Day together. And of course, there will be Häagen-Dazs® Vanilla Bean Ice cream -- or what's a Heaven for? A cannibal who killed and ate parts of his mother had his sentence reduced by a judge who said 'he needed to eat'. The 27-year-old was given a lenient prison sentence because the judge said he was starving and needed to eat after spending all his money on vodka. Yes, what you just read is the lead to an article which made news in England. Even The Brits consider this irrational behavior on the part of the Russian Judiciary. We have just established the boundaries of what The Brits consider "acceptable". Some of us may think that this compares unfavorably with the British policy which forbids possession of firearms by private citizens. Or the right of self defense by whatever means available during a Home Invasion. Here's the implication. If you're a British Subject (they don't have "citizens" any more), and you're attacked in your home by a drunken "Yob", your best defense is to slice off some muscle tissue and eat it. Better if you cook it, of course. I recommend saute with virgin olive oil and a little garlic. Wash it down with a nice Chianti. When the Bobbies learn that you ate human flesh, they will be so distracted they will forget that you used your Public School Cricket Trophy to bash his head it. No weapons charge! Of course, you face the risk of having used a knife to butcher the poor, deprived innocent Yob. But with any luck, they will be impressed by your determination not to bother National Health Service after the innocent Yob has bashed your head it with your own Cricket trophy. Reading this over, I don't see a Down Side. "Abort Health Care Reform" from "The Smallest Minority"
In his indefatigueable drive to examine in excruciating detail the "Health Care Reforms" of President Obama, Kevin Bacon scores another Major Hit in the "A-Zone" of the Obamacare Bill. A "UK Expat now living in New Zealand " commenter described as "Phil B." describes his personal experiences with Socialized National Medicine (Obamacare in the UK) in prolific and turgid prose. It's not a pretty picture, and it bodes ill for the American of Socialized Medicine. Go there, and read the whole thing. Can you say "You can't make a weak man strong by making a strong man weak" children? This is from a pamphlet published by Boetcker called "The Ten Cannots", according to (the often egregiously erroneous) Wikipedia. It's a shame that the quote was cited as according to Abraham Lincoln; it undermines the veracity of the thought. However, taken together "The Ten Cannots" should -- and perhaps would, under other circumstances -- provide us with some guidance, some perspective, in regards to the wisdom of mandating (as Rep Rogers says) that 85% of us should be penalized for the (unproven) benefit of the other fifteen percent. I'm not saying that I don't agree with Mr. Rogers; I'm only saying that if you're going to support your political/social/cultural position by quoting A Great American, it would be wise to choose the Great American who actually said it. Here's a one-minute quote of Mister Rogers, speaking to an almost empty house about Democrat health bill cuts $500 billion from critical Medicare services. Obamacare is famously said to be designed to save health-care monies by cutting services to Senior Citizens. I'm on the cusp, this is ALL I have to look forward to for my future health care, and I'm pissed. President Obama's "Strongly Disapprove" vs "Strongly Approve" poll difference has reached 14% - "a record" according to Kevin McCullough's Town Hall Blog. 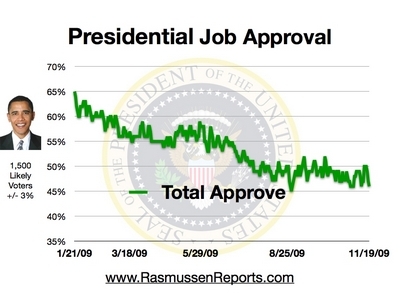 McCullough based this comment on a recent Rassmussen Poll on Obama's "Presidential Job Approval". ShieldsUP! is a useful tool which collects no cookies and does no harm to your computer, but tests your internet connection to determine vulnerabilities (such as unshielded ports, etc.) The tests are free, you need not subscribe, they don't know who you are except that they do have your IP address and any information they can derive from that. It takes a while to run some of the tests, but in non-prime service hours I ran the full port test in 68 seconds. Result: all of my ports were found to be "stealthed", as opposed to "closed" or even (shudder) "open". That is, if someone tries to ping me the port pretends that I don't exist and doesn't even attempt to respond ... which some 'closed' ports may do. My protection is from Norton Internet Security, a subscription service which I renew annually. It includes Norton Antivirus and Firewall protection. I recommend it highly, it's worth $45 $69.99 before $30 rebate a year to me. You may not be interested in this, but it's a very Geek thing to do, don't you think? Mounting evidence that independent voters have soured on the Democrats is prompting a debate among party officials about what rhetorical and substantive changes are needed to halt the damage. Following serious setbacks with independents in off-year elections earlier this month, White House officials attributed the defeats to local factors * and said President Barack Obama sees no need to reposition his own image or the Democratic message. Since then, however, a flurry of new polls makes clear that Democrats are facing deeper problems with independents -- the swing voters who swung dramatically toward the party in 2006 and 2008 but who now are registering deep unease with the amount of spending and debt called for under Obama's agenda in an era of one-party rule in Washington. If the independents are dissatisfied, how must the Conservatives feel? Democrats can't survive without the Independent vote. Time to pay attention to independent polls. Hey, Democrats! Lose the Socialist program, start working on bills of less than 2000 pages and 2 trillion dollars. This would be a big, BIG help if you're really serious about the 'transparency' and 'hope & change' thingies. We hope you won't change us beyond recognition, okay? Americans are proud of America. This would be better supported if our President didn't feel inclined (sorry for the pun) to bow subserviently to foreign rulers. How many 3rd World people want to immigrate to Saudi Arabia or Japan anyway, huh? Show a little backbone, Dude! For our president to pubically appease Communist Radicals (Saul), native terrorists (Bill), and Home-grown America-Haters (The Rev) are not examples of the America that most Americans wish to be admired. Why can't the Pres change his ways and pay public homage to patriotic Americans? This would present a more consistent image of traditional American Values, which would be less confusing to people of other countries. If we aren't demonstrably ashamed of our country, and the people who made our country great, maybe people in other lands can understand why we are proud to be Americans. Most everyone else in this country is on track with this program, why shouldn't our President synchronize with American Pride? Colgate sells toothpaste by telling the world about the benefits of its product. Shouldn't the American President sell America in the same way? * "Local Factors" are local in the same way that Americans are local: we are all Americans, and should be marketed as an admirable, coherent product with universal appeal. Wall Street gets this; Madison Avenue gets this. Why can't our President understand this? When Local Factors demonstrate dissatisfaction, a smart CEO pays attention. When he doesn't, his company goes down the tube. This is almost as fatal to a government as it is to a business corporation. The difference is that a President has four years to prove his worth, while a corporation is only as viable as the next stock-holder meeting -- which is an annual event. Perhaps we should hold Presidential Elections more frequently? You couldn't run a successful business the way Obama runs the greatest nation in the world. Perhaps there is a lesson to be learned, by the man who has never been the Chief Executive of a business. Perhaps there is a lesson to be learned by the electorate? WILMINGTON, Del. - A liquor store clerk shot and killed a suspected robber overnight in Wilmington, police said. Up to three men wearing masks entered the Favors Liquor Store on Walnut Street around 9:30 p.m. Guns were allegedly pointed at the clerk inside, and money was demanded. Police said the 55-year-old clerk soon pulled out his own gun and started shooting. One suspect was hit, dropped his .22-caliber gun, stumbled 40 feet outside of the store and died. Police don't know if the clerk's gunfire might have struck the other hold-up men, who fled. The USS Hartford, a submarine based in Groton, Connecticut, collided with the USS New Orleans, a Navy amphibious ship, on March 20 in the Strait of Hormuz. It caused a fuel leak and minor injuries to 15 sailors. "It was inspired," Jacob Rehm, 38, said outside court Tuesday. "I felt inspired." Rehm, a former bus driver for Lamoille Valley, took the bus from the company's depot Nov. 2. Accompanied by friend Natalie Page, 38, he headed south toward Allentown, Pa., but turned around somewhere in Connecticut after he realized the $200 worth of diesel he had bought wouldn't get them to Pennsylvania and back. Police caught up with him in the northern Vermont town of St. Johnsbury after the company's owners were told he had been seen driving through a schoolyard waving at children. And he took a video, which he posted on YouTube. * Starting with a shot of guinea pigs and caged parakeets, in the last shot of his video Jake is shown cuddling with one of his no-longer-caged birds ... kissing it ... and then tucking it back into his shirt. No word yet on whether the bird will take the full ride a la Burt Lancaster, but Jake is obviously riding for a fall. Jake, I think you're going to experience enough "negativity" over the next few years to last you for a lifetime. Next time you take the bus .... "Leave the Driving to US", eh? Dude, you are "Jake Rehm", not "Jack Kerouak". You're fifty years from Easy Rider. Also, you're not Ken Kesey, you're not a Merry Prankster nor did you steal the Majic Bus. As much as we admire your 60's style hippie free life style, you have given it all up to spend the next few years in the pokey. Oh, and when you get out? Your girlfriend won't be waiting for you. And neither will your guinea pigs and your parakeets. At the ARPC match last weekend, many people approached me to inquire how SWMBO is doing. She's doing about as well as can be expected, under the circumstances. But she misses her friends, going to matches, spending time on the range, and shooting. She wanders around the house muttering "I've got to shoot something." I assume she means targets, but in any case I'm safe. I robbed all of her .38 Super ammunition months ago so I could shoot matches. She has lots of .38 Special ammunition left, but I'm still safe; those are reserved for her Home Defense guns. She's too proud to shoot Revolver under any but the most dire situation. ... if you want to get the right pictures. Both Samsung cameras cost more than I want to spend, but if I were certain that they include all of the features I want, I would be willing to pay the extra buck$. As the saying goes: "The thrill of paying a low price is undermined by the disappointment of low quality". Or perhaps more accurately: "Some people will by anything if they can get a bargain price; others will pay a higher price to get what they want." But the bugger of the deal is, it doesn't tell me specifically that the video includes sound, or whether you can zoom while filming video. The good news is that there seems to be a 20 minute limit on the video length, while the Canon A1000IS seems to limit videos to 3 minutes. No, I don't understand the seemingly contradictory specifications, but I'm not buying until I can work it out; it seems to me that the lower (15fps) density should provide a recording time than the higher (30fps) density. And again, I don't know if either of the mentioned cameras allow zoom-while-recording in video mode. they are no more knowledgeable about digital camera specifications than are available online. So I'm still looking for a real authority, who can answer my questions about the available digital cameras. I was spoiled by the HP camera, until it died on me. With a little fiddling, I can still get it to work. Unfortunately, HP no longer makes or sells digital cameras, and their customer support is non-existant. Apologies for the digression here from my usual USPSA-themed articles. Oh, wait ... I spend more times on politics and cultural themes than I do on shooting themes, don't I? Perhaps I'm less geekishly one-dimensional that I thought. Anyway, the purpose of my interest in photography is mainly involved with shooting USPSA matches with gun and camera, both. At the last ARPC match, I had the best intentions of filming the New Shooters so they would have a record of their first match. The demise of my camera stopped that, just as my inability to find my bifocals stopped my ability to hit targets consistently. I definitely have to get back to Open Division! Both in firearms, and in cameras. My HP R967 camera has bit the dust. Died. Given up. Failed to Function. Whatever description you choose, it is no longer usable. The battery latch mechanism is no longer functional, and it just doesn't work. This is the third HP camera which I have bought, but which broke for one reason or another. My first HP (R767) was made unusable by my carrying it in my hip pocket on an extremely hot day. The display screen was electronically (though not physically ... I think) shattered. The viewfinder still works, but I can't see the image I'm recording. Well, it was unable to capture high-density photos .... every picture I took came out a little grainy, and the color was distorted toward the blue end of the spectrum. The second HP (R867) was drenched when a bottle of water was dumped in the camera bag ... in which the camera was being carried ... during the 2007 Croc Match. After I dried it out, I discovered that videos are all captured in a 'reverse color' format. This third HP (R967) will no longer hold the battery in place. I can't do a thing with it, it's totally dysfunctional. Too bad; it had some features which I liked (including the ability to zoom while recording videos). I've wasted a lot of time searching for a replacement compact digital camera on the Internet, and in desperation I'm asking my readers if they can recommend a replacement. It's no good looking for a new camera from Hewlett-Packard. Apparently, HP no longer makes or sells digital cameras of any description. Must not only take still pictures (preferably 10-12 MP density), but also be capable of recording video (motion) with sound. Must record videos in MP3 or similar format; I don't want QuickTime videos. Must be able to zoom while recording Video . LCD (or similar) display should be over 2"; would prefer to also have a view-finder but this is not a deal-breaker. Still photo options must include delay, should include burst, and should include date/timestamping. I don't care much about "face recognition technology", but it should be able to shoot into the sun without color distortion. Should have a 'sports' or other stop-motion "high-speed capability to take still photos without blurring the image. Highly prefer "HP R07" rechargeable battery type, because I have several and spare batteries are expensive. Zoom lens is, of course, a 'given'. Bottom line: I want a compact digital camera with both still and video (with sound) capabilities that I can afford and will give me some unique options when filming videos. In other words, I want my old camera, but I can't find one. If you own, or know of a camera which fits all of these criteria, I hope you will let me know. I finally found one on AMAZON - another used HP R967 for under $200. I bought it. But I'm still disenchanted with HP Digital Cameras. I've gone through too many to be phlegmatic about their durability, and I would rather have something that is a but more robust. This new/used R967 is only a stopgap. The request still stands: if you are aware of a compact digital camera with the capabilities I've described, please let me know. I really want a good camera for taking pictures of USPSA matches. Obama revives talk of U.N. gun control: "Arms Trade Treaty"
George Bush wouldn't have it, and George Bolton, his Ambassador to the United Nations fought it. It's the "UN Programme of Action on the Illicit Trade in Small Arms and Light Weapons". Secretary of State Hillary Clinton isn't Bolton, and President Barack Obama isn't Bush. Between the two of them, Hillary and Obama are deliberately moving this nation toward the signing of a treaty which would force the United States to accept the supremacy of the United Nations to dictate National Policy in regards to the Second Amendment. Gun rights supporters are up in arms over a pair of moves the White House made last month to reverse longstanding U.S. policy and begin negotiating a gun control treaty with the United Nations. Secretary of State Hillary Clinton first announced on Oct. 14 that the U.S. had changed its stance and would support negotiations of an Arms Trade Treaty to regulate international gun trafficking, a measure the Bush administration and, notably, former Permanent U.S. Representative to the United Nations John Bolton opposed for years. Two weeks ago, in another reversal of policy, the U.S. joined a nearly unanimous 153-1 U.N. vote to adopt a resolution setting out a timetable on the proposed Arms Trade Treaty, including a U.N. conference to produce a final accord in 2012. "Conventional arms transfers are a crucial national security concern for the United States, and we have always supported effective action to control the international transfer of arms," Clinton said in a statement. "The United States is prepared to work hard for a strong international standard in this area." Gun rights advocates, however, are calling the reversal both a dangerous submission of America's Constitution to international governance and an attempt by the Obama administration to sneak into effect private gun control laws it couldn't pass through Congress. This seems to reference to the "... international transfer of arms", but in fact it would affect the ability of every American to "Keep and Bear Arms". Or to purchase, exchange, trade or give firearms to every other person or merchant. This isn't a Paper Tiger. You may be asking: "What's the big deal? The Second Amendment protects our rights. What we agree to in terms of International Trade has nothing to do with us." The problem is that the United States is close to signing an International Treaty, and this is the single move which can immediately and irredeemably counter the U.S. Constitution, or any law. In other words, if the United States (in the person of President Obama) signs this treaty, and it is ratified by Congress, then all existing laws ... up to and including the Constitution ... are over-ruled. all Treaties made, or which shall be made, under the Authority of the United States, shall be the supreme Law of the Land; and the Judges in every State shall be bound thereby, any Thing in the Constitution or Laws of any State to the Contrary notwithstanding. That means exactly what it says. If we enter into a treaty with the United Nations, and that treaty is or can be interpreted as disallowing the purchase or ownership of Small Arms, then that becomes the Law of the Land and it cannot be reversed by the Constitution, State Law, or any court in America. This is exactly the kind of tool which any wanna-be Dictator would elect to impose his own private vision of a disarmed citizenry. In fact, I'm unclear on the process ... would it be necessary for this treaty to be ratified by Congress? Can the president sign this treaty and unilaterally impose disarmament on the strongest country on earth? The ARPC match this weekend not only allowed the November Introduction to USPSA class members to complete their training and certification, but it also served as a forum for earlier class members to 'show their stuff' now that they are no longer under the burden of proving that they can shoot a match safely. All five of the graduates from last weeks Introduction to USPSA class graduated with honors: they engaged all targets of the six stages safely, and at least one (Brandon) won an award for finishing high in his division/class. We emphasize in the Live Fire portion of instruction that participants should conscientiously avoid trying to move and shoot fast, but Brandon is such an accurate shooter that he prevailed against several difficult stages; he certainly performed much better than I did in most stages. Ultimately, all of the class participants proved to be not only very capable/accurate shooters, but comfortable with the USPSA rules, gun-handling, and competitive priorities. When I left for the match, the ambient temperature was 32 degrees; when I arrived at 8am, the temperature was 36 degrees and I had finally defrosted my windshield and the rear widow of The Egregious Explorer. I "armored up" with Rain Pants and Rain Coat, but in truth the weather was much more mild than I had expected. I kept telling my squad-mates that it would "rain before we get out of here", but it didn't rain all day -- disregarding the pessimistic forecasts of weather.com. In my mind, that only proved that even God was willing to ignore His previous intentions to prove me wrong. I love it when a plan comes together. I often wear rain-gear and even carry an umbrellas, on match days which coincide with dubious forecasts. If it rains, I'm a reliable prognosticator; if it doesn't rain, I have obviously sacrificed my reputation to the benefit of my squad. This weekend, I may have appeared to be A Dolt but I consider myself a Weather Hero. Well, we take our successes where we can. We always enjoy new shooters, and these were no exception. Oh, and if you are a New Shooter, please feel encouraged to bring your Better Half to the range. We like to meet the family, and be assured that we will do our best to coerce her to start shooting the matches, too.